Pallbearer has leaped to the forefront of the doom scene, perilously approaching that kiss of death for modern metal bands, appeal to a mainstream audience. In this case, though, any purists have very little to complain about. Despite the progressive tendencies appearing in their third LP, Heartless, it retains their bedrock sound and atmosphere of tragic grandeur while letting the band explore some new territory. The crushing, mile-high wall of doom riffs, executed in the band's trademark retro-style overdrive, continues to be present, and as usual it is very difficult to get tired of it. But differences start appearing right away. I Saw the End has a lot more emphasis on soloing and even speed towards the end, and though the track following it gets some satisfying crunchiness in the riff department along the lines of the earlier albums, there is a softer tone to Lie of Survival's quiet parts, even from a band that never had any difficulty providing an equal mixture of heaviness and delicacy. With the production pushing Lie of Survival in a more intricate direction, the always-emotional delivery of Brett Campbell's clean tenor is brought to a cathartic sorrow by the end of the song. 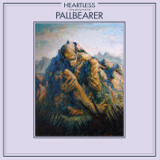 Though the quiet passages of Heartless fail to turn aside the metal that remains at the core of Pallbearer's musical style, the fairly solid output of doom metal produced by the band on previous albums has now given way to a few distinct innovations. The sadness of most of the music is occasionally replaced by despairing anger both in vocals and riffs; on the title track, some gang shouts and more distorted solos are tried out (showing that the band's guitarists can do a mean pinch harmonic). In keeping with the band's tradition of saving the most epic track for the end, A Plea for Understanding proves to be the longest and most involved yet -- but there are fewer crushing riffs embedded in this one, and a smoother, more layered approach takes its place. Pallbearer's attempt to flesh out their sound while still keeping the metal front and center may be a difficult path; doom metal history is full of bands that ended up moving on to other styles as they improved and evolved their sound. But meanwhile, we can enjoy a solid but emotional album that the band's experimentation did not hurt at all. It may be Heartless, but soulless it is not.